Is your site stale, out-dated and in need of a facelift? Do customers stick around long enough to learn about your business or purchase your products and services? Or are they leaving your site shortly after entry? If your site is slow loading or a customer can't figure out how to get to specific content, they will leave. The World Wide Web is full of impatient surfers who expect instant gratification and quality service. Do visitors view your site as credible and professional? If not, a potential customer will become wary and do business elsewhere. Close deals faster and attract more customers to your site — with BITS' website redesign services. Our services guarantee a high percentage of uptime, no slow pages and, better still, quality design and content to encourage customers to stay and explore your site. Whether your site needs an easier navigation system , a more sophisticated look or a total make-over, BITS can help. Businesses change over time and your web site needs to keep up with these changes. Keep your site up-to-date. BITS can transform dull pages into stunning visuals — keeping customers coming back for more. You can keep your present content and simply change the look. Or change the content and preserve the look. Perhaps your business has expanded and your site no longer represents your latest services and products. Maybe your company's logo or color scheme has changed. Having a business identity and brand that is consistent throughout your marketing collateral is crucial to your business' success. Your brand needs to be recognizable and memorable to acquire new and retain your present customers. BITS can help your business by creating new logos and headers for your website. 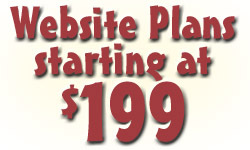 Even better, we can add brand new colors, new photos and graphics to your site to increase your site's "WOW" factor.